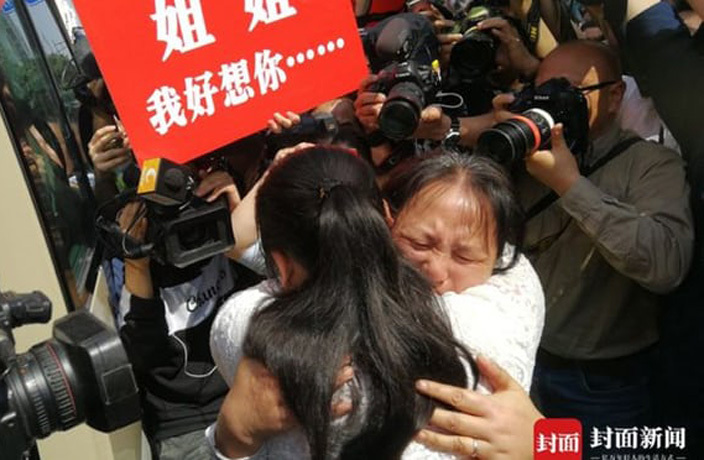 “From now on, your father is here,” said Wang Mingqing to his long-lost daughter Qifeng on Monday when the two were tearfully reunited after 24 years apart. Every parent’s worst nightmare came true for Wang back in 1994, when his 3-year-old daughter disappeared from a fruit stall he ran with his wife in Chengdu, Sichuan. According to The Guardian, Wang had briefly left his daughter while getting change for a customer at a neighboring stand; she was gone when he returned. Wang and his wife Liu Dengying desperately searched Chengdu for their lost daughter. But in a city of over 8 million people, “it was like looking for a needle in a haystack,” Liu said. Even after years of fruitless searching, though, Wang never lost hope. He put advertisements in newspapers, asked people online for help and finally, several years back, began driving for ride-hailing service Didi in the hopes that “he might one day pick her up as a passenger,” according to BBC. He placed a sign with information about his daughter in the rear window of his vehicle and handed out cards profiling his lost offspring to customers, asking for help from anyone who would listen. This year, a 27-year-old woman named Kang Ying living in Jilin province, thousands of kilometers northeast of Chengdu, noticed a picture online that strongly resembled her. It had been drawn by a police sketch artist who had heard Wang’s story. Kang’s adoptive parents had told her they had found her on the side of the road in Chengdu, and she’d always wanted to know who her real parents were. According to local media, Kang had lived with her adopted parents only 12 miles away from Chengdu. After talking online with Wang, Kang decided to get a DNA test. The results proved that she was indeed his missing daughter, Qifeng. This past Tuesday, Kang Ying and her family flew from Jilin province to Chengdu to reunite with her biological parents. As you’d expect, it was a very emotional reunion, with Kang hugging her mom tightly and weeping tears of joy. “My efforts of 24 years were not wasted,” Mr. Wang told his friends, according to a BBC report. Another five Chinese people were injured in the attacks, with two of them severely wounded. The Kung Fu Komedy podcast is back! This week they discuss Fan Bingbing's disappearance following a tax evasion scandal. Show Us Your Halloween Costume and Win a Chengdu Hotel Stay! Got a creative Halloween costume? Here's your chance to win big!